In 2011 I walked the Camino Frances, and like so many who have taken this ancient pilgrimage across Northern Spain, I found it to be a profoundly life-enhancing experience – I would even say life-changing. This is not easily shared with people who have not experienced the Camino de Santiago, so ‘accredited peregrinos’ generally return home with high hopes that every friend and loved one ‘do’ the Camino too. And we carry the personal longing to return to Spain and experience another aspect of the Camino all over again – or at the very least meet up with others of the ‘Camino Community of Brotherhood’. Thus I suppose it is quite logical that I (together with good friend Jeremy Burnham) have been moved to create what we call the abaHamba mini-Camino. 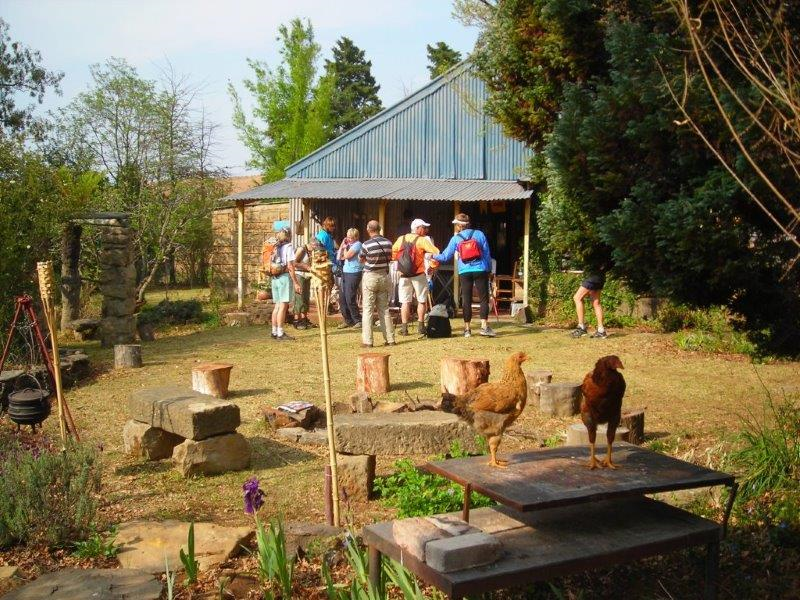 These events take place over a long weekend on my somewhat remote farm, Moorfield, in the mountains of KZN (border NE Free State – about 4 hours from either Jo’burg or Durban). The terrain in these parts is not only spectacularly ideal for hiking (and not unlike areas of the Spanish Camino), but has the additional boon of being completely safe. To date we have had three very successful abaHambas. Some participants had already done one or more Caminos in Spain, others came to do a ‘trial Camino’ and find out more. They all came to enjoy the unique camaraderie of this kind of event. We set out on walks together, stop off at one of several waterfalls for lunch, and then return home to relax, some to watch Camino-related DvD’s, and everyone to cook and share meals together. 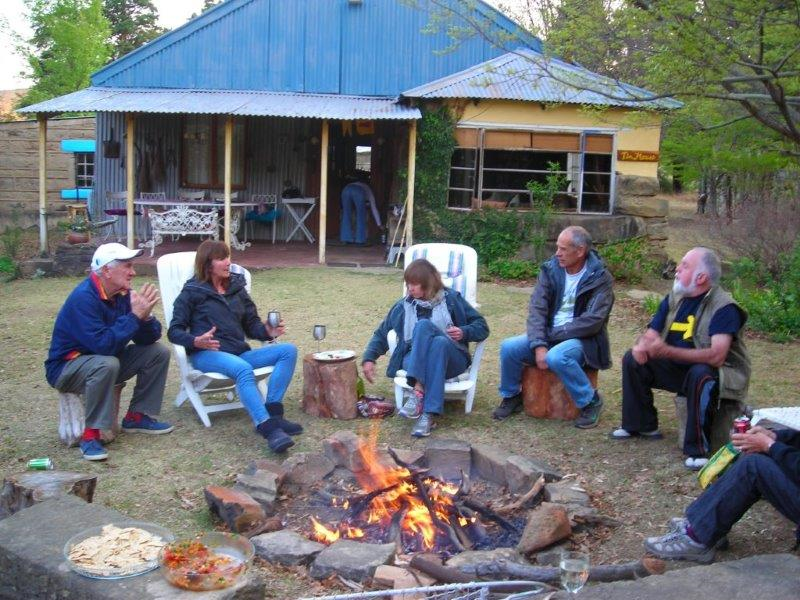 A highlight is gathering around the fire-pit on the final evening for a braai. An aspect of the abaHamba that everyone loves is story-telling - an opportunity to share Camino experiences (some of them quite miraculous). How generative it is to tell one’s story to others who have had similar experiences - both the outer and the inner journey of being a pilgrim. And a great way for those who have not yet walked the Camino to get a real feeling of what pilgrimage is. 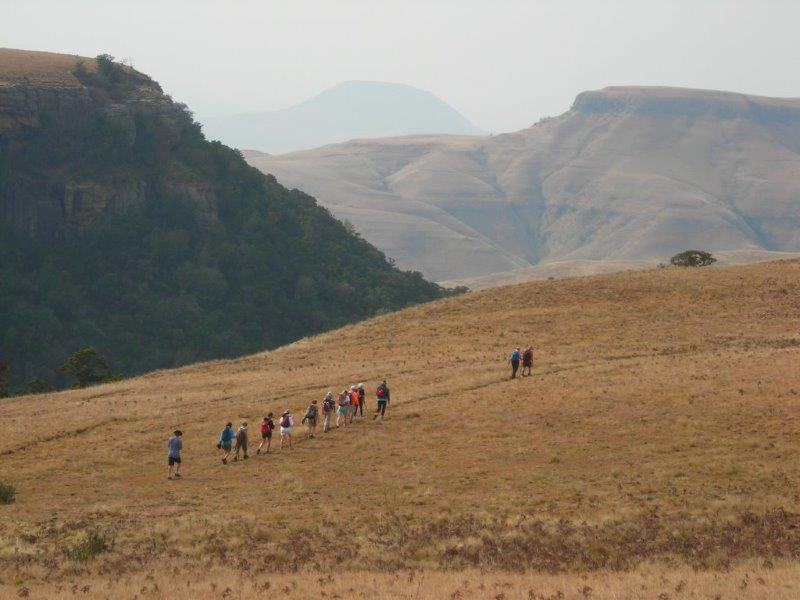 Easy walking over the Grasslands, which lie on the edge of the deep forested Gorge, with magnificent mountains rising all around. This route of nature initiation has left its traces. When an initiate moves through nature, he not only has nature experiences with the elemental beings, with the starry realms, he also leaves his own impression on nature. When travelling through the Pyrenees, people are strangely moved. Why? Rudolf Steiner says there are Grail-elemental-beings in this area. They descend from the slopes of the Pyrenees and they can be found in the mountains and plains of Spain. In turn Parzival, and those who followed him, impressed upon nature the character and mood of the Grail. Rudolf Steiner called anthroposophy "a science of the Grail". He says, "modern initiates can be called the initiates of the Grail". He points to the fact that the earthly Grail Mysteries were established in northern Spain, and that the Camino must be viewed as closely connected to these mysteries. I find this all quite enthralling. It brings together and sheds light on two passions of mine - my new-found romance with the Camino, and my long-time fascination with the story of Parzival. I have already begun to map out a Camino-route that traces and echoes Grail and Parzival association, a route I hope to explore and test not too far in the future. Relaxing at the fire-pit after a day of walking. Setting off - without the chickens! There are many facets to preparing for a walk of several hundred kilometres, both in terms of gear and physical fitness and also in acquiring some knowledge of the route, of overnight accommodation available, and such vital information as laundry facilities, food and "How will I get by with my three words of Spanish?" The historical and legendary aspects of the Camino are fascinating - churches, monasteries, hermitages, convents, chapels and cathedrals abound. During my own preparation I began to wonder if Rudolf Steiner had ever written or lectured on the Camino. Well, I was delighted to come across the book Paths of the Christian Mysteries – From Compostela to the New World by Virginia Sease and Manfred Schmidt-Brabant, and not at all surprised to learn that Steiner provides unique insights on the Camino. He calls the Camino "the path of nature initiation", whose guide is the goddess Natura. Steiner speaks quite explicitly about the stages of initiation related to the earth terrain where the pilgrim experiences step by step the path of the sensory world up to the threshold of the spiritual world. We learn that there was a historical Parzival, whose epic journey of initiation took him across the Pyrenees into Spain, where he forged a route that undoubtedly included, in part, that of the present-day Camino. Steiner calls Parzival the emissary of Christ. 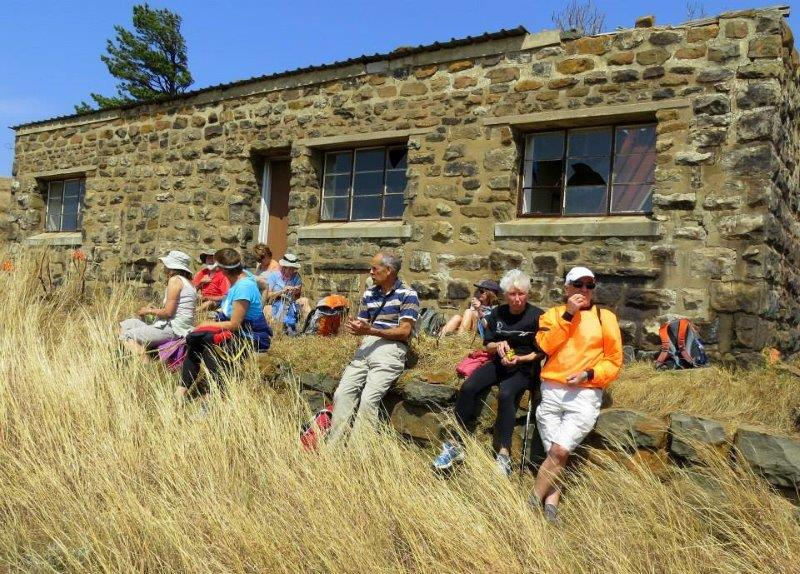 Resting at Ncandu Mountain Huts. For more information on the abaHamba mini-Camino click here. For a reference and testimonial on the abaHamba mini-Camino click here. For more information on Moorfield Farm click here.